High ranking U.S. politicians as well as the FBI and DOJ are attempting to prevent, and discredit, the release of a memo that allegedly details abuses of power at the highest levels of government. The memo written by House Intelligence Chairman Devin Nunes (R-Calif.) is based on nearly a year of research. In a statement released on Jan. 31, Nunes says regarding the findings in his memo, “It’s clear that top officials used unverified information in a court document to fuel a counter-intelligence investigation during an American political campaign.” That investigation, of course, was aimed at Trump and his campaign. The release of the memo is expected on Thursday or Friday, and there has been a concerted effort to prevent its being made public, waged heavily by those it allegedly exposes. After fiercely objecting for weeks to the release of the memo, House Intelligence co-chair Adam Schiff (D-Calif.) sent a letter to Chairman Nunes on Jan. 31 alleging that changes were made after the committee had voted on it. Schiff said that therefore should be a new vote before the memo’s public release. A White House intelligence source told the Washington Examiner’s Byron York, that the changes made consisted of “grammatical and clarifying” fixes. One change was requested by the FBI due to a concern about sources and methods possibly being exposed, and a one-word change was requested by the Democrats for accuracy. House Committee rules do not require a revote when minor modifications are made. House Minority Leader Nancy Pelosi (D-Calif.) went as far as writing a letter to House Majority Leader Paul Ryan (R-Wis.) to remove Nunes from his position. The saga is the latest in a series of attempts in the last two weeks to prevent the memo from being released to the public. The DOJ, including the office of Deputy Director Rod Rosenstein, have objected to its release. Rosenstein, however, is allegedly mentioned in the memo as having signed off on a FISA warrant despite knowing the evidence was based on unverified information. Republican lawmakers who have seen the memo have described the actions contained in it as a potential threat to the republic, and as something every American has the right to know. President Donald Trump on Tuesday, following his first State of the Union address, said that it would be 100 percent certain that the memo would be released. 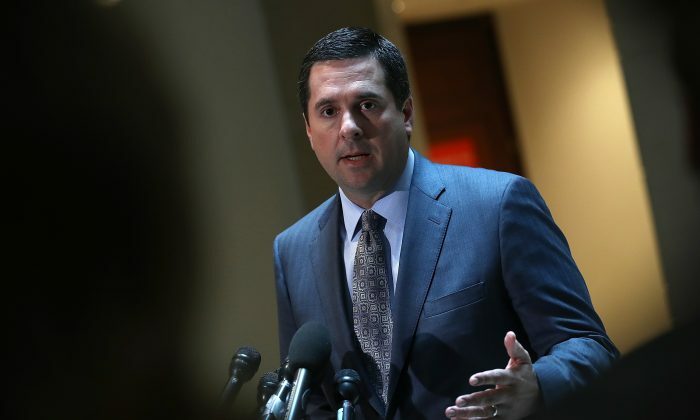 The memo is based on nearly a year of research by Nunes, which started when he first revealed last year that senior Obama administration officials had made dozens of so-called unmasking requests for the identities of members of the Trump team during the elections. In early January, the DOJ agreed to provide Nunes’ committee with the documents he had been seeking for months, involving the so-called Trump dossier paid for by the Clinton campaign and the Democratic National Committee, as well as details on FBI agent’s Peter Strzok and Lisa Page, who had sent thousands of text messages revealing a clear bias in favor of Hillary Clinton and against Donald Trump. Strzok was the lead FBI agent on both the investigation into Clinton as well as into Trump. Deputy FBI Director Andrew McCabe was forced to resign on Monday the day after his boss, FBI Director Christopher Wray, read the memo.